Base Pair scientists have invented an exclusive technology enabling multiplex SELEX, or simultaneous selection of aptamers for up to 30 targets. Projects involving aptamers to multiple targets are completed more quickly and cost-effectively. Standard aptamer selection involves multiple rounds of SELEX to generate an enriched pool of aptamer sequences. It often takes a number of weeks to generate aptamer sequences for a single target. Base Pair has developed a patented technology that allows us to perform SELEX for up to 30 unique targets simultaneously. Through our patented process we are able to easily identify aptamers to each individual target, dramatically reducing selection time for multiple targets without increasing time for downstream aptamer analysis. Base Pair can perform multiplex SELEX for related or unrelated targets to select aptamers designed to perform under the same conditions. Patented, multiplexed, simultaneous aptamer selection against related targets coupled with deep, next-generation sequencing allows aptamers with unique binding properties to be readily identified via comparative analysis. Multiplex SELEX coupled with comparative sequencing analysis enables Base Pair scientists to develop aptamers to closely-related, but molecularly distinct, targets. This capability is especially important when targeting families of proteins, proteins and receptors, phosphorylated and non-phosphorylated proteins (or other post-translational modifications), similar classes of small molecules, and related drugs and drug metabolites. In one study, multiplex SELEX was applied to four related targets in the same aptamer selection under identical conditions. 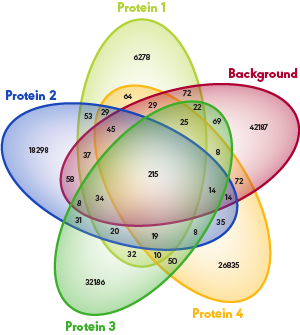 The Venn diagram below shows the unique sequences determined by Base Pair’s in-house Ion TorrentTM sequencer. 19 distinct aptamer sequences binding all four targets were identified. Many aptamer sequences unique to each individual target were also identified. With multipex SELEX, multiple aptamers selective for individual targets can be identified from the same SELEX. Selection cost per aptamer is reduced and aptamers are selected in a highly competitive environment, promoting greater selectivity and improved binding characteristics in a complex matrix environment. Learn more about using multiplex SELEX to generate selective aptamers for your application.